Description: Magento Blogger Templates is custom color template, the best feature of this theme is, it has 2 comment form area. Visitor can easily switch from Blogger to Google+ comments by tapping on the tabs. The social bookmark buttons are designed in a very elegant style. Post tags are embedded above the bookmark buttons. Whenever the visitor reach down after reading the article, we have fixed the scroll to top button in the footer area. Once they click on that button they will end up coming to the top of the page. 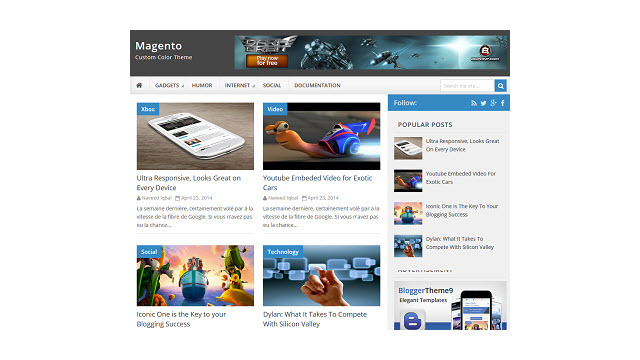 Magento is precisely for personal blogs, Magazine, Technology and gadgets related blogs. Post can easily shared with your friends on whatsapp.